I won’t make it any secret that I love Abathur – not just in his playstyle but also in character from Heart of the Swarm. It makes sense that someone who debuts in HotS, is also awesome in HotS – am I right? This will be the first in a sequence of posts about Abathur, and I’ll likely be focusing on him during updates especially during the alpha and beta phases. With so many changes coming to heroes as well as maps, it gets kind of overwhelming to keep on track of it all! With the Heroes alpha entering its final phase this week, let’s take a basic look at Abathur as the servers come up for people wanting to try out this interesting hero! Never seen before in MOBAs, Abathur is a hero that hides behind the safety of the base, or if he’s feeling more daring in the fog of war or in bushes and nooks and crannies. His base damage is the lowest in the game, and his base health is the second lowest after Murky. Essentially, he doesn’t want to be the target of any warrior, let alone assassin. Fortunately he has abilities that have global or near-global presence that allow him to make a difference even while hiding out of sight of the enemy team. Every 20 seconds, Abathur will spawn a locust that waddles down the nearest lane to ultimately meet its demise against anything that they meet down the lane. They have similar health to creeps, and can aid in the potential pushing power of whatever lane Abathur chooses to be in. Buildings will prefer to hit creeps and mercs before the locusts, so make sure to take that into account when building your talents. With a little extra tip: spawn your first locust between your fountain and core to make sure the first one doesn’t needlessly suicide himself into towers, and not to mention giving away your lane position to the enemies early on. Combat Adaptation [Level 1] – 20% increased attack speed. Survival Instincts [Level 1] – 30% increased health. Assault Strain [Level 13] – They begin to cleave and explode, dealing damage, on death. Bombard Strain [Level 13] – Gain a sieging ranged attack. Not many DNA-altering worms can ride mounts, and as awesome as Abathur is he’s no exception to this rule. On a 30 second cooldown this ability is what Abathur gets instead of a mount, and it’s the ability to travel anywhere he likes on the map as long as he has vision of that area. I’d hate to miss out in this section that his [W] Toxic Nest ability grants a small patch of vision around it, so as long as it’s not in a dangerous location Abathur essentially has the potential for global presence in not just his abilities, but in himself as well! There is a second or two of casting before you tunnel away though, so keep a keen eye out for any threats around yourself should you need the escape. The channel can be stopped by stuns, but not damage. There are no talents that affect Deep Tunnel. The bread and butter for Abathur, what he will be spending most of his time revolving around in every map, and what makes him unique to anything seen before in the genre. He can Symbiote into a target at global range, give them a snazzy hat, and gain three new abilities that I’ll outline below. For the effects of Symbiote itself, Abathur will cocoon himself and as a result will be vulnerable to enemies as the Abathur playing will have reduced focus on where he’s left his body. Placing yourself in a defensive or aggressive positions before Symbioting will have a massive effect on Abby’s playstyle and the awareness of the player behind the screen. You can Symbiote heroes, creeps, mercs, towers, forts and the core itself, and any kills or structures destroyed while under Symbiosis will grant Abathur’s team exp. Symbiote lasts 45 seconds, though you can leave the target at any time by hitting R once inside – do note that even when the 45sec timer runs out or if canceled early, Symbiote will be start a 4 second cooldown, the first second of which is a self-stun on Abby, where other abilities will queue up and be cast when that stun is over. I will admit to having repeatedly set Toxic Nests around in bad positions because of this… You will continue to spawn locusts while inside your cocoon. As for who’s best to Symbiote? I usually take whoever has high DPS anyway, as you can do some devastating work with well-timed stabs and spike bursts, but also be on the lookout for heroes about to lose or flee fights (ally or enemy), helping out with merc camps, or low health heroes near your creep waves. Symbiote also starts afresh with max charges and all abilities ready to use. While there are talents that affect the abilities inside Symbiote, the ability itself doesn’t have any talents that affects it. Land mines with massive range (or talented for unlimited range), you start off with 3 mines in the beginning of the game and charges replenish every 12 seconds. Because of Symbiote, it can be fairly challenging to keep track of and maintain maximum uptime on the Nests, as it only takes 36secs to refill all charges of mines and Symbiote lasts another 9 seconds on top of that – once you’ve played Abathur enough, it gets into a fair simple routine of breaking Symbiote, planting 3 nests, and finding a new target to Symbiote, all in that 4 second gap. Do be aware that it takes a few seconds for the nest to activate, during which it can be attacked and destroyed. Once it does activate however, it becomes invisible to enemies! It doesn’t do game-breaking damage, but the utility it can provide can separate a good and bad Abathur in matches. As mentioned earlier, Toxic Nest has great utility, and you can use it for three main uses: To help nuke a lane of creeps; to place them in strategic positions to deal damage to roaming heroes and dismount/unstealth them, or even uncover nearby bushes for your allies; or to scout out specific points on the map such as merc camps or objectives, to help find out where the enemy is when you can’t see them. Envenomed Nest [Level 1] – Detonated nests deal an extra 30% damage over 3 secs. Ballistospores [Level 4] – Turns the impressive range on Toxic Nest into global range. Vile Nest [Level 7] – Detonated nests leave a 50% snare on the target for 2 secs. Prolific Dispersal [Level 13] – Increases maximum charges to 5. Not only does Abathur have to be unique in the MOBA genre for being the only hero to take part in team fights by hiding, he also is unique in Heroes itself in that he’s currently the only hero that has the option of a single heroic talent at level 10, and also misses out on having an E ability – not even anything passive like what Raynor has! Nevertheless, the heroic ability he does have access to only deepens his depth and complexity. At a 120 second cooldown, and for 45 seconds, you can copy a hero on your team, appear next to them, and be able to take part in team fights as that hero until either you die or the timer ticks out. You don’t get the talents the ally has picked up unfortunately (other than their heroic they’ve chosen), so Evolving into a Sgt. Hammer for example who relies on her talents to do well would not be a good idea. However someone like Tychus would be brilliant if he’s taken Odin, as the abilities inside it aren’t affected by talents, so you’ll perform to near-maximum effect. This is where Abathur gets his mark as being one of the hardest heroes to play, as you have to have a good idea if you need high damage for a situation or lots of CC and support, as well as having a general idea about the strengths and weaknesses of every hero without the strength of their talents! Not being comfortable in that regard can severely handicap your team – I’ll likely do a breakdown of different heroes and how useful they are to Evolve into at a later date. When you evolve into another hero, the heroic ability is on cooldown for 15 seconds to balance out clutch heroics. If you want to set up something such as staggered Void Prisons, make sure to evolve with time to spare before initiating a team fight (though you do lose out on a third of the buff if you’re not going straight in). As a bonus, Abathur’s body itself vanishes from the map during this time so you can use your heroic as a clutch escape if you find yourself in a bad position. It has saved my wormy bacon in the past when I go for aggressive positioning, so never underestimate holding off using it whenever it’s up. When the time’s up or you die in the evolved form, you return back to where you left your squishy body, so make sure you’re not bringing enemies to a dangerous position for yourself when the effect ends. Also, when you’re Evolved, you will cease to spawn any locusts until you return to your wormy self. Evolution Master [Level 20] – Increases duration to 60secs, and lowers cooldown to 90secs. Abathur gets access to three new abilities whenever he’s inside an ally: Stab, Spike Burst and Carapace, as well as the option to leave the Symbiote prematurely by pressing R.
Beginning the game at two charges, and on a 5 second cooldown, this becomes Abathur’s largest damage dealer in the game. It’s a medium-range skillshot that deals fairly mediocre damage from the start, however with talents you can easily make it a much more deadly ability that has often led me to hero damage of 100k+ in many matches, while still maintaining high siege damage. The damage of Stab doesn’t correlate to who you Symbiote, so your own locusts can become a death trap to unsuspecting heroes! Barbed Spines [Level 4] – Increases damage by 20%. Grooved Spines [Level 7] – Increase skillshot range by 33%. Spatial Efficiency [Level 13] – Increase charges of Stab to 3. Spike Burst is a point blank AoE on the target you have used Symbiote on, at a 6 second cooldown. Very useful in maps like Garden of Terror or Haunted Mines, as killing small groups of mobs are a part of the main objective of the map. It’s also useful if you team up with someone to clear out the jungle, especially the knight camps. In addition, when using Symbiote on the core, the damage of Spike Burst is increased, and has a much larger area of effect that can be useful as a last-chance effort to fight back multiple lanes of creeps. Carapace plants a shield on your host for up to 8 seconds, while Carapace itself is on a 12 second cooldown. You usually use Carapace immediately after Symbioting a target, as it’s on such a long cooldown, however in some cases it might be better to hold off on it until your host is ready to dive in and use the shield, especially as the green globe effect over the hero is far easier to notice that Abathur’s in a target than the hat, so you can punish sloppy play by your foes with a couple of extra Stabs or a Spike Burst before they realise an extra damage source is in play. With talents this ability can include a shield, a heal over time and movement speed increase – an excellent compliment to play a more defensive game instead. However, leaving the host before the shield lasts its 8 seconds will cancel the shield and any additional benefits you may have talented into. Overall, when you play Abathur more and more and become more efficient on him, you get into a good routine that involves leaving when all abilities are on a cooldown greater than 4 seconds, and re-Symbioting a target will grant fresh cooldowns to release even more of a burst of damage. Bridging the gap between a good and great Abathur player will be able to do the Symbiote dance while weaving in the Toxic Nests between Symbiote casts. If anything, the heroic is a refreshing break from the constant button-mashing that’s involved with Abathur’s standard play. Promote [Level 4] – Gives a lane minion +300% health and +100% damage permanently. I don’t think I’ve ever even tested this out as every other option in that tier is more useful for Abathur in any situation. There was a time where it was bugged and you could cast it on the Dragon Knight and Grave Golem, but other than that I can’t really comment too much on it. Has 2 charges and a recharge of 60 seconds. Calldown: MULE [Level 7] – Useful against teams that are pecking away slowly at your base, you can just slowly rebuild your lanes back up (assuming they haven’t already been destroyed) and just help reinforce the defense. At no downtime for how much it rebuilds, just be aware that the MULE can be attacked and killed before it finishes repairing – it also restores ammo! Lasts for 60 seconds, cooldown of 60 seconds. Locust Brood [Level 16] – Spawns three locusts at a target location near Abathur. These locusts gain all the talented upgrades received earlier in the game, so can be used for devastating split pushes. Bolt of the Storm [Level 20] – Short-range teleport that persists through Ultimate Evolution. Gives you a bit more utility for certain abilities when you do use your heroic on someone. Largely upgrading the heroic will be more beneficial, however the escape potential or the aggressive blinks could win specific team fights as opposed to just being able to 5v5 more often. Zeratul – With being able to stealth in and blink out and deal a significant amount of burst damage, a roaming Zeratul doesn’t have to sacrifice too much to be able to take you out. Nova – Similar to Zeratul in the she has her stealth to make roaming very simple for her, but she also has the bonus of range, and a holo-decoy to take some tower or fort fire before taking you out. Illidan – I still have nightmares about his heroic… Not to mention evasion and the ability to hop over walls and have insane burst. Tyrande – What? A support is dangerous to us? Admittedly she’s a damage-focused support, but how is she more dangerous than the three assassins above? Shadowstalk will uncover your position very easily for the enemy team, and as she’s support they’re likely going to have at least one of the three heroes above, and in Illidan’s case he’ll also be invisible while he gets into position to take you out. Make sure to pay attention to your own health, as her Sentinel when upgraded does have the chance of two-shotting you while you think you’re comfortable inside your egg. Next article I will be focusing on specific maps and what builds I go for in them. 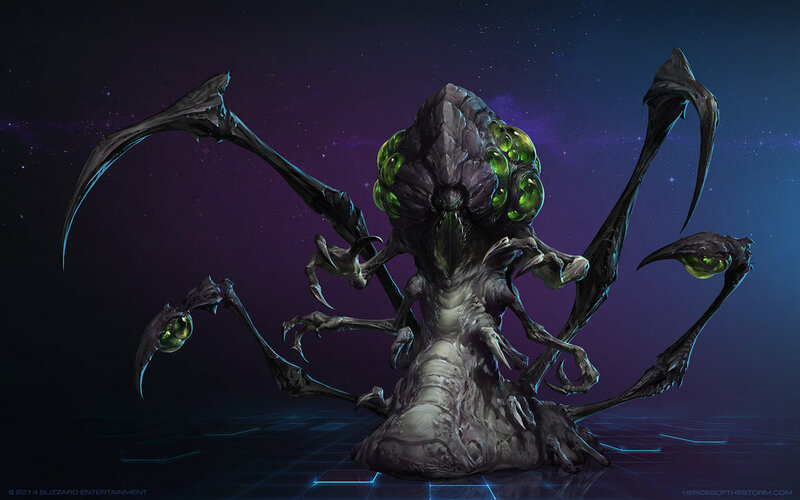 As the Evolution Master, Abathur’s role within the game certainly evolves over time as he picks up more and more talents, and he’s extremely versatile depending on what your team needs or what the map has to offer his toolkit.